Manchester United manager Jose Mourinho says "every player has his price", which may pave the way for the January departure of Henrikh Mkhitaryan. 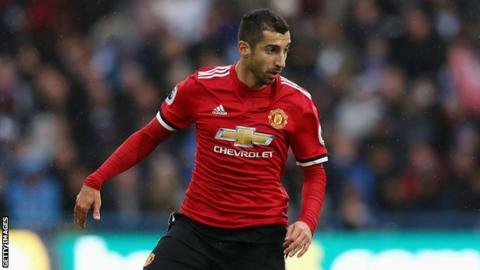 The Armenian playmaker has not started a game since the defeat at Chelsea on 5 November and has not been in the matchday squad for the last four games. Mkhitaryan became Mourinho's third signing when he joined from Borussia Dortmund for a £30m fee 18 months ago. But BBC Sport understands there has been a "breakdown of trust". Speaking before Sunday's trip to West Brom, Mourinho said: "If a player is not happy and brings with the request a number we consider good for us, I would never say no. "That is my approach as a manager. Every player has a price." Last January, Mourinho allowed Memphis Depay to join Lyon and Morgan Schneiderlin to move to Everton. He subsequently released Bastian Schweinsteiger from his contract so he could take up a lucrative offer with Chicago Fire in Major League Soccer. Defender Luke Shaw is another potential January departure, although the indications have been that the former Southampton player intends to remain at Old Trafford for the rest of the season. Marouane Fellaini's contract expires at the end of the season and, so far, United's efforts to persuade the Belgian to sign an extension have failed. However, Mourinho likes the midfielder and selling him is not thought to be an option, particularly as Fellaini knows he can maximise his earnings in the summer if he left for free.